One of the disappointing elements of Geoff Johns and Ivan Reis’ otherwise-fantastic Justice League #23 was that we saw the Sea-King only for a panel before he practically keeled over dead for whatever reason. Seeing a hooked-and-bearded version of Aquaman, if his evil twin from Earth 3 at that, was a great moment and I’m really sad that he didn’t get to do more. But that’s where DeMatteis and Janin have come in. They’ve been building up the mystery of the character’s return for the last few issues and this is where they finally peak it as the Sea-King does come back, and rather explosively at that. In Phantom Stranger #14 we saw that Blight, the embodiment of evil and darkness in humanity, had finally gained itself a human host and attacked Constantine’s “new” Justice League Dark team in retaliation for their assault on him. This issue carries on straight from there as we see the team floating in a psychic void, almost dead, and with Constantine apparently beheaded. I still don’t comprehend it fully but somehow DeMatteis and Janin made a beheaded Constantine into a great narrator and commenter on what’s going on. Its all rather morbid, but definitely in keeping with the tone of both the book and the character, who has grown on me as a really great character thanks to Jeff Lemire’s previous tenure on the title and DeMatteis’ current run. With the Sea-King involved, we go to the depths of the Western Pacific Ocean and discover some old mysteries that haunted the Earth in ages past and which the dead Sea-King has somehow made his own. The entire sequence provides one of the most thrilling moments in the entire issue and the consequent conflict between the team and the Sea-King makes for a really great subplot. Its all over a little too quickly for my tastes, but I recognize that this is the point where the entire Blight arc needs to hurry itself up and not linger on. But I can still see how the Sea-King will re-feature in the future issues, especially given how the team deals with him. And in the midst of it all is Phantom Stranger and his various mysteries, which can often be quite frustrating on their own, but are great nonetheless. And the cliffhanger ending of this issue certainly proves that. My jaw dropped when I saw that final page, because of how big a twist in the entire story it was. It all just makes me want to read Phantom Stranger #15 right now but sadly that title isn’t going to be out for a while yet. On the art-front, Janin, Vicente Cifuentes and Guillermo Ortega do an awesome job once again, with inker #3 Jordi Tarragona and Jermoy Cox on the colours with Steve Wands on the letters. One of the stand-out panels of this comic is when the team goes to the Western Pacific on the back of a huge moss-backed whale summoned by Swamp Thing. A really gorgeous panel and a great moment in the story. Then there’s the entire fight against the Sea-King and his new-found allies. Together, all the artists continue to prove that Justice League Dark is one of the most gorgeous looking books from DC on stands right now and I wish that the book was twice as long each month so that I could get more of their work to appreciate with each issue. Overall, a great chapter in the ongoing Forever Evil: Blight arc and I loved that the Sea-King got to be badass here for a few moments and I’m rather excited where the story goes next. 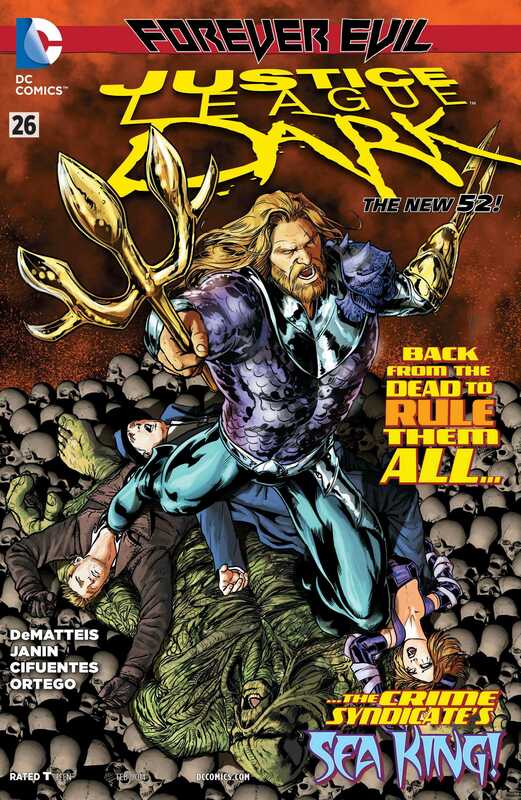 More Justice League Dark: Volume 1, Volume 2, Volume 3, #22-23, #24, #25. Posted on January 1, 2014, in Comics Reviews, Review Central and tagged Blight, Comics, Comics Review, Constantine, Crime Syndicate, Crime Syndicate of America, DC Comics, Earth 3, Evil, Forever Evil, Forever Evil: Blight, Guillermo Ortego, Horror, J.M. DeMatteis, Jeromy Cox, John Constantine, Justice League, Justice League Dark, Mikel Janin, Mystical, Nan Madol, New 52, Nightmare Nurse, Phantom Stranger, Review, Review Central, Sea-King, Superheroes, Supernatural, Swamp Thing, Trinity of Sin, Vicente Cifuentes. Bookmark the permalink. 11 Comments.